Jungle Red Writers: The Poster Child for Persistence: Meet Jack Getze! The Poster Child for Persistence: Meet Jack Getze! LUCY BURDETTE: If anyone thinks getting a book published is a cake walk, I beg you to read this essay by our friend Jack Getze. He's a model of persistence and good humor and we're delighted to welcome him today! JACK GETZE: No one's called him immortal, but it's easy to imagine my funny-mystery series protagonist as a zombie. Despite being dead and buried in1987, then again in 2008 after a brief revival, my anti-hero stockbroker Austin Carr keeps clawing back from the grave. Scruffy, naïve, cocky, shady, scumbag, accursed and a hot mess are a few of the terms Goodreads reviewers have used to describe Austin. Obviously, not everyone's glad he's back. Too bad you humorless villains, Austin's first new adventure in six years, Big Mojo, is being published any day now by Down and Out Books. And guess who gets a share of the blame? Why none other than the Seascape Writers class of 2013, the mighty critique group engineered by Jungle Reds Hallie and Lucy, with a late assist from Hank. I was the only male there. I had my ears pinned back a few times, but a much improved Big Mojo manuscript emerged, a tale without prologue and a story in which scenes got "unpacked." Thanks ladies. If it's a flop, I'm not blaming you. I started Austin Carr's first adventure the next morning before dawn, and placed him in an older Jersey town, near but not on, the Jersey Shore. Like Austin, I'd recently moved to such a place from southern California, and Austin's perceptions about Jersey being tougher were very much my own at the time. Probably more perception than truth. And probably more the result of a former newspaperman unexpectedly having to feed his new family on a one-hundred-percent commission sales job. Luckily for you mystery readers, Austin's strange mindset gave way to more interesting tales I heard from my Jersey co-workers: Men being yanked off fishing boats by giant Bluefin tuna; a stockbroker who married a dying client's rich new widow. That first version of Big Numbers took two years to write and earned a New York agent, but no publishing deal. After a year the agent gave up and Austin Carr was dead. Unlikeable. I stuck him in a drawer and started something else. Twenty years later (I'm not kidding. TWENTY YEARS!) another agent was working with me on a thriller about a bark-smoking Cahuilla Indian. When this second agent declared the latest version of my Indian tale a total disaster, she suggested I needed to work on something else for a while, clear my head of "whatever you were thinking." After asking what other stories I had in the drawer, she said, "I like the stockbroker." Something clicked for me this time (2006), an obvious but heartfelt way to make my anti-hero more likeable, and although my agent was thrilled, said very encouraging things, New York still wouldn't bite. After a year of rejection, and at my agent's suggestion, Austin ended up with a small regional publisher. Money, came out. And while the third novel was written, Big Mojo never saw the light of day. My agent planned a move to greener publishing pastures, but we ended up stuck in the mud of a crashing world economy. From 2009 through 2012, nobody would consider our series. "My boss would fire me if a bought a story with a stockbroker protagonist," one editor and friend told us privately. All that changed in 2013 when Eric Campbell of Down and Out Books agreed to re-ignite the Austin Carr Series. Zombie time. Last year he published new editions of Big Numbers and Big Money, and now Big Mojo will finally see daylight. Woohoo! 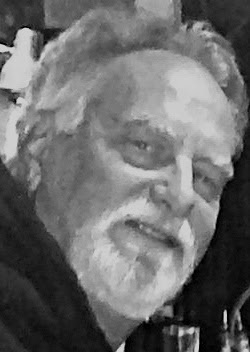 D&O has some well established writers in the stable, including Robert J. Randisi, Reed Farrel Coleman and Les Edgerton, so I'm thrilled to be included. Any other writers have a similar experience with a story or character? Tell me how long one of your people festered in a drawer, and three commenters will receive a copy of Big Mojo, Big Numbers or Big Money, either eBook or paperback, their choice of one book. About Big Mojo: Wall Street's miasmal garbage washes up on the Jersey Shore when a small time broker falls in love: Is he attracted to the beautiful lady -- or her brother's inside information? Held spellbound by an auburn-haired beauty with a get-rich-quick, insider trading scheme, Austin Carr knocks down a beehive of bad-acting Bonacellis, including the ill-tempered "Mr. Vic" Bonacelli, who wants his redhead back, and local mob lieutenant Angelina "Mama Bones" Bonacelli, architect of a strange death trap for the fast-talking stockbroker she calls smarty pants. To survive, Austin must unravel threads of jealousy, revenge and new affections, discover the fate of a pseudo ruby called the Big Mojo and slam the lid on a pending United States of America vs. Austin Carr insider trading case. Can Austin and his Jersey Shore mouthpiece possibly out maneuver the savvy U.S. District Attorney from Manhattan? Will anything matter for Austin ever again if Mama Bones flips that switch? 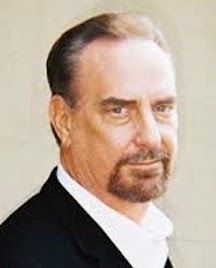 Jack's Bio: A former reporter for both the Los Angeles Times and the Los Angeles Herald-Examiner, Jack Getze is Fiction Editor for Anthony nominated Spinetingler Magazine, one of the internet's oldest websites for noir, crime, and horror short stories. 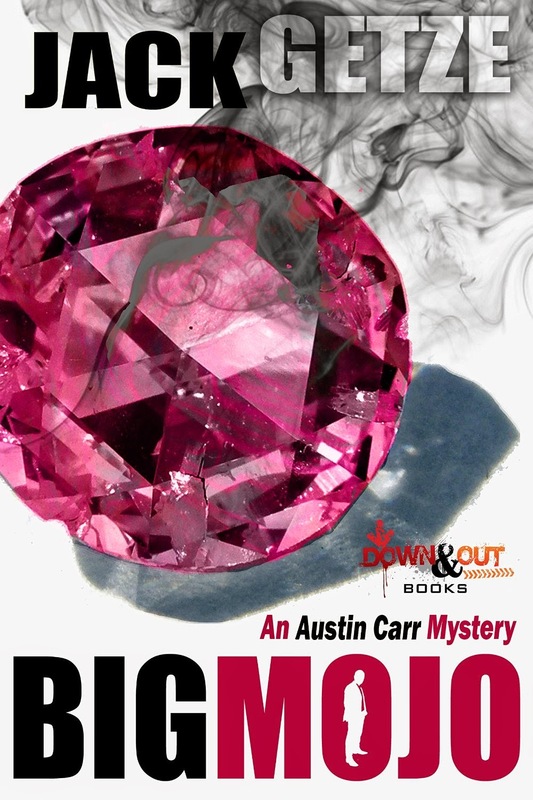 His Austin Carr Mysteries BIG NUMBERS and BIG MONEY were re-issued by Down and Out Books in 2013, with BIG MOJO due in 2014 and BIG SHOES in 2015. His short stories have appeared in A Twist of Noir, Beat to a Pulp, The Big Adios and Passages. No experiences to share, but I admire your perseverance! And it's good that Austin Carr is so enduring --- congratulations on the new book . . . .
No stories to share here, either, but congrats on seeing the third book finally printed. I'm a big fan of Jack's rough and ready writing style. So happy for you, Jack, and what a great sense of humor. Love that: Zombie time!! Oh, the irony. I wrote a story for Mystery Scene Magazine back in 2007 headlined "Mr. Persistence." Thanks Joan, Mark and Hallie. It's easier to be persistent when you have a wife who takes you to France. I just had lunch on the Champs-Elysees. Wow. Warm sunshine and a fine bottle of vin rouge. Maybe I should take up painting. I'm so happy you persevered. I've read the first two and I'm looking forward to reading Big Mojo. Dru, you are a peach. Hugs and kisses. I've had a completed novel sitting in a drawer for ten years. I sent it out once to one of the MWA competitions, but except for that, no one but a few writing friends have seen it. It needs more revision. It always seems to need more, even though I know an editor who'd like to read it. Ultimately I think I'm scared to send it out. I'm not exactly sure why. So ten years. Someone beat that. Oh, P.S. Congratulations, Jack. So happy to hear your good news. Jack Getze, you are so funny! Congratulations on this new book and think about the rest of us while you're strolling the streets of Paris. Jack's in Paris AND he has a new book out? Your cup runneth over. Have a great time and break out a bottle of bubbly for that new book!! Woo-hoo!! I had an editor give me the kiss of death on a manuscript once: "I'm sorry, it would do well as midlist fiction, but we don't see it being a best seller...."
Can't wait to read Big Mojo. I've got a title for one of your future books, loosely autobiographical, with street scenes from France: BIG TALENT. You are an inspiration to keep on keeping on. I'll bring you back the Eiffel Tower, Roberta. I bought four of them from a guy in front of the Louvre. Thanks so much for having me on the Jungle Reds. Barb: Things might have gone a little better for Mr. Persistence if he'd found you before August. I think you need to show that novel, though. Award-winning short story writers should have the agents lined up. Thanks Kaye. I can't think too much about other things while I walk in Paris, however. Pay attention or get knocked down! Flora, that was one tough editor. Smart, too, if he knows a bestselling manuscript every time he reads one. The Don Quixote statue was a lucky find--and pure psychological projection on my part. Maybe all writers should have one to scare the pants off us to say it isn't so. Make sure it isn't so. 128I will read anything Jack writes... even his grocery lists. I always play a version of "Where's Waldo" with his novels that I like to call: "Where's the redhead?" Jack is a warrior! "My boss would fire me if a bought a story with a stockbroker protagonist," made me laugh with recognition. When I was reading for the 2012 Best Novel Edgars, I saw book after book with evil fund managers, corrupt bankers and murderous financiers. A stock broker protagonist? Never. An excellent lesson in both perseverance AND how forces beyond our control in the world or in the publishing industry can make an otherwise good book "unsalable." Glad you're getting another turn at bat, Jack! Well, Jack, I must first say that I always enjoy reading your witty comments here on Jungle Red, and your post today was equally a treat. So, your books must be great reads, and I'm so happy that they have been given new life. I love that you were at the workshop with Hallie and Lucy, and it just provides more evidence to my opinion that you are rather unique. One might even say quirky, my favorite characteristic in a person or, well, character. Julia makes such an excellent point about world situations affecting the saleability of a book. And, then there is the matter of "hot topics" serving the author, e.g., vampire lore. You are to be commended for your "Mr. Persistence" stand. And, France? Really, Jack, you are having a good year! Thank you, Kathy and Hank. Quirky and amazing sound good to me. Thanks for taking the time to check out the blog. Hi Jack! Chiming in from Annapolis, better late than never. Thanks for the encouragement, Jack and Roberta. I appreciate it. Jack, congratulations on your persistence and success. It's funny how the "real" world affects our novels. When I started writing my Seamus McCree novels in 2002, I made him a bank stock analyst who quit because a boss had changed his report. By the time the first one was published in 2013, it was necessary to have him quit well prior to 2008 so that his act was still one of conscience rather than appearing to be one of convenience. !